Well! I finished Block 10 of Threads of Memory – only 3 weeks late and just in time for Block 11 on the 29th! Whew! I have tried many ways to do the elongated star points. First try was with the EZ rulers, templates, and finally I found Eleanor Burns had a wonderful way to make them. Just like her rulers for flying geese – these come out perfect every time. It is so much more fun when a quilter finds a ruler that really works to perfection every time. 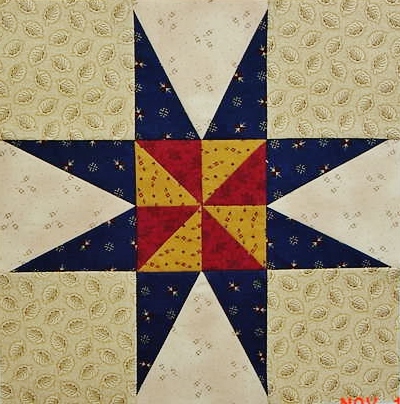 Now on to my review of the 4 patterns for my Bird of Paradise Quilt Top (CWB, Lost Boy Quilt, A Bountiful Life). I did a little research this afternoon and found that on the New York Museum website that the quilt top that really matches the original is Lost Boy Quilt and A Bountiful Life. Patricia Cox has changed the outer border by adding leaves and flowers, CWB added birds and flowers only – no animals. So I believe I will stick with the Lost Boy Quilt and use other pieces of the other patterns if I like their animal or people templates better than the original ones. Because Karma was hanging over my head today – no electricity from 8:30 AM to 1:00 PM. I should have known that the day was not going to be the best Monday for me – I have a Pedometer for my morning walk. This morning the dumb counter was not working correctly – I only walk about 30 minutes and after walking 20 minutes it was not registering – HA – I fixed that problem! I sat down on the porch and shook the dumb thing until it registered my 30 minutes. Now you might think this is cheating, but since I had walked my time and I track my steps each day and keep a record – I was not going to let that little ole’ Pedometer mess my day up! Heck No. Our electric company was doing that for me without even realizing it! Being without electricity and heat did not bother me because I have 2 nice size windows in my Studio (in the ’30’s with a nice wind chill), so I tried to pull some fabrics and work on Happy Scrappy decisions (a little difficult to do with a flashlight), reviewed my 4 patterns (outside in the sunlight before Clay started gassing me with the tractor fumes) and started to bring a quilt outside to finish the binding, but at the last-minute decided to knit! Well, that was not the smart thing to do – I messed up a row and did not realize it soon enough – so now I have a big mess and hopefully I can correct it! I finally just gave up and completed some “have to do” things and at least I have made a decision to start on preparing all the blocks for my Bird of Paradise Quilt Top during the day and work on other UFO applique projects in the evening. My friend Jaydee told me I could be a Sponge (soak it all in and worry and fret) or be a Duck (let it roll off one’s back) Quack Quack Quack. Cross your fingers – hopefully I can kick Karma out and be a better Duck – Quack Quack – tomorrow! I even have Clay Quacking when things tend to not turn out like we perfectionist/planners/organizers prefer! Somehow it does help to laugh and start saying Quack Quack! So Happy Quack Quack Day to all and hopefully my day tomorrow will be more productive. Who knows. Maybe it will be a quiet and peaceful day tomorrow. This entry was posted in Uncategorized and tagged Bird of Paradise Quilt Top, Threads of Memory Block 10. Bookmark the permalink. ← Does Organization Count in Quilting? I always had trouble with the long point stars too until I purchased Eleanor’s ruler for them. A sponge or a duck — I love that! Let’s all be ducks (as long as it’s Rabbit Season, that is). I hope your power is back on and that your quilting karma has returned as well. That lost boy/CWB appliqué project is going to be spectacular whichever way you go with it!